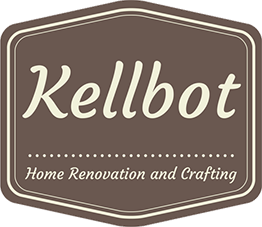 Coming Clean - Kellbot! | Kellbot! Commenter Tim asked how I keep the house so clean, especially in light of having a baby. I’ll tell you: I cheat. I almost always do a quick pick-up of a room before taking a photo, and usually only even think to do a house-related post when the house is in a semi-presentable state. In my most recent weekend-update, I’d just vacuumed the room because installing the window blinds left a fine layer of dust and metal shavings everywhere. I’m proud of the fact that it’s still not too terrible, and our overall level of house cleanliness is decent. Keeping the house in order takes a lot of work, but is crucial to keeping our overall stress level down. Have a place for everything, and don’t buy anything you don’t know where you’ll put it. I’m a sucker for kitchen gadgets, an affinity RD does not understand, but I’m allowed to buy whatever stupid kitchen items I want provided I can find a place to put them away. Open sink policy – meaning no dirty dishes are left in the sink ever for any reason. Every now and then I backslide on this, but it works pretty well. Dirty dishes are washed immediately and set on the drying rack. We do have a dishwasher but we only use it when we have company over or I want to sterilize the baby bottles. Daily chores. Cleaning a little each day is SO much easier than letting things pile up and then having to set aside an entire afternoon to dig out your living room floor. I had a page-a-day cleaning calendar at the old place, and need to update it for the new place. The last secret is that I have help. RD’s aunt comes for a few hours each day so I can work (I do freelance WordPress development), but the truth is about half that time gets spent on household chores. I can get some done while Bitmap naps, but having someone occupy her for a couple hours so I can take care of things is amazing. When people ask if I miss living in New York, I think about all the extra help I get by living near so many family members and the answer is unequivocally no. I might miss a few aspects of it, particularly my friends, but I am so very glad we moved down here when I got pregnant. My own parents didn’t get their first night out sans-baby until I was 5 months old. Bitmap is 3 months now and I’ve lost count of the number of dates we’ve had thanks to my in-laws. Family FTW. Ah ha! 🙂 That makes me feel better. And you know, that’s a happy level of clutter. Feels homey/ lived-in. I try to take care of all dishes before bed that may have accumulated during the day. I’m a believer in having a fresh start every morning. So, admitingt to a little jealousy.. The family situation you have there is pretty amazing. Our son is almost 13 months old now, and we’ve been on two dates. We recently decided we need help, and have someone coming over twice a week, starting today actually. Hopefully soon that will extend to some evenings! 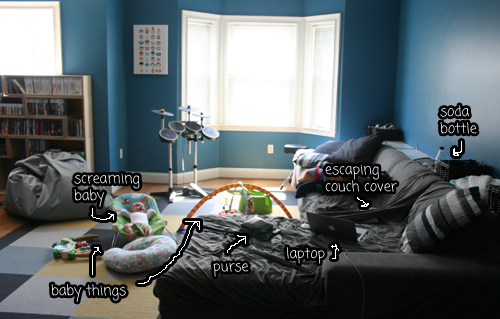 If I really wanted to be honest about clutter, I’d show you a picture of my office. But I’m pretty sure the world’s not ready for that. I know we are incredibly lucky to have the family situation we do. And even so, admitting I needed regular help with the baby was tough for me. I spent a lot of time feeling like I “should” be able to manage on my own, because plenty of other parents do. But once RD went back to work I felt incredibly jealous of him. His aunt is a kindergarten teacher and off for the summer, so things worked out perfectly in that regard. I still feel a little guilty that pawning my kid off on someone else for a few hours is necessary for my sanity, but I’m slowly getting over that.